A change of plans sent Christian Wilkins to Clemson instead of the Heights. Sometimes the eyeball test is all you really need. 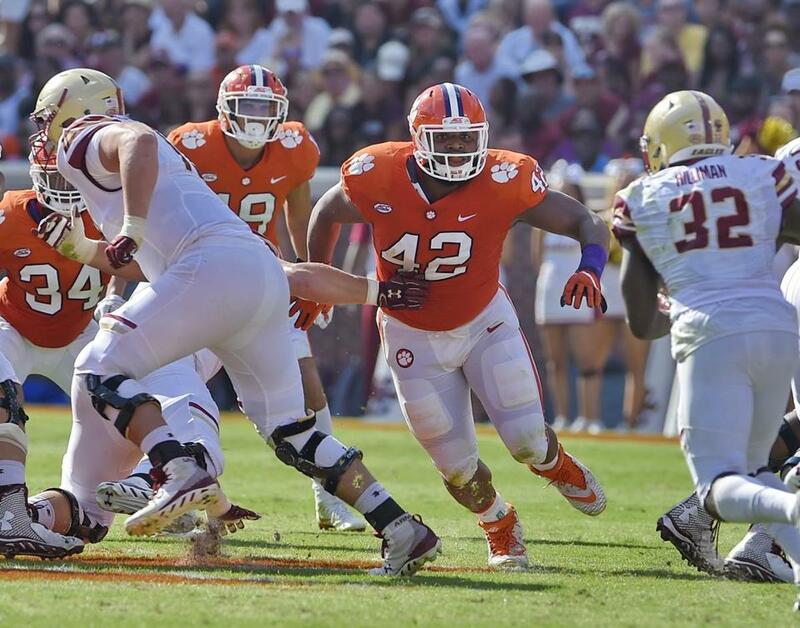 Connor Strachan was just a freshman at Boston College when the Eagles were trying to woo Christian Wilkins, Clemson’s ultra-hybrid defensive tackle, to the Heights. Beyond the fact that Wilkins was one of the nation’s top-rated players (not to mention No. 1 at his position) coming out of Suffield Academy in Connecticut, it made immediate sense to Strachan why the Eagles coveted him so much when they met on Wilkins’s official visit to BC. The intangibles that might make him a good teammate jumped out immediately. But what was impossible to ignore about Wilkins was his mountainous 6-foot-4-inch, 315-pound frame. It was like staring up at a hulking comic book hero. “Massive in high school,” Strachan said. “Even at that age, I was sitting next to him — I think we were at a hockey game or something — and his legs were taking up three seats. Growing up in Springfield, Wilkins was a diehard BC football fan. He saw the Eagles at the height of the Matt Ryan era. He had close ties to late Eagles defensive tackle Ron Brace, who was also a Springfield native. He looked up to some of the faces of that defense, from defensive tackle B.J. Raji to defensive end Mathias Kiwanuka to linebacker Mark Herzlich. The dream was always BC. But when Wilkins began considering his future and the places football could ultimately take him, the machine that is Clemson caught his gaze. Even as the Eagles have to game-plan for Wilkins’s menacing presence as second-ranked Clemson comes to the Heights Saturday night, no one can argue he didn’t make the right choice. In four years, Wilkins has become one of the most frighteningly versatile defensive tackles in the country. The opportunity to go to the NFL was in front of him after last season, when he racked up 53 tackles (8½ for losses) and 4½ sacks. He was projected as a first-round pick but instead put the pros on hold. He had broader ambitions. He graduated with a degree in communications in just 2½ years, the first scholarship player to do so at Clemson. He spent the offseason substitute teaching at an elementary school not far from Clemson’s campus. He returned knowing he could improve his draft prospects, but also for the chance to help Clemson clinch its fourth straight Atlantic Coast Conference title, something no team has done since Florida State’s run of nine from 1992 to 2000. Now, the program he worshiped as a kid is one of the last hurdles in Clemson’s way. The Tigers (9-0 overall, 6-0 ACC) have run roughshod over conference opponents. But the 17th-ranked Eagles (7-2, 4-1), who climbed seven spots in the Associated Press Top 25 after last Saturday’s 31-21 victory at Virginia Tech, have a buzz around them that they haven’t seen since the days when Wilkins was watching Ryan. Having ESPN’s “College GameDay” on hand for the 8 p.m. matchup adds extra juice. But the opportunity to ostensibly play a homecoming game already heightened things for Wilkins. In no way is Wilkins feeling conflicted. “As a young guy, you’re a fan, then being recruited, you’ve got to make some decisions that are best for you as a man,” he said. “Now playing against them, I’m not a fan at all. I want to crush them.